Book Summary: Belle has dreamt of adventures like the ones she reads in her books, of traveling the world outside her small town. When Belle's father is captured, she takes his place as a prisoner of a fearsome Beast. But life in the enchanted castle isn't as terrible as Belle imagines, and she ultimately finds friendship and love. 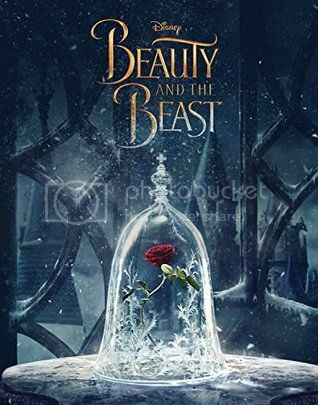 Enjoy this tale as old as time about adventure and love, about looking past first appearances, and about the inner Beauty and Beast in all of us in this beautiful novelization of the upcoming star-studded film! I have loved Beauty and the Beast ever since I first saw the cartoon in 1991. I was preparing for my senior year when it came out and I remember going to see it several times every weekend with my sister. It was the best bonding-with-your-sibling experience we had together. It had become my overwhelming favorite Disney movie. When I heard there was to be a live action remake and that Emma Watson was cast as Belle. I was excited because I love her as both an actress and as Hermione Granger from Harry Potter. Even with the teaser trailers and full trailers coming out, it still held my excitment. That was until I saw the movie and was disappointed. Maybe the teenager in me was not thrilled with the idea of the remake or there was just some sort of magic missing from it. I could not put my finger on it. But I thought I would try to read the novelization of the movie. Maybe there would be more to the story. Maybe there would some sort of added info that would help reestablish a bit of love for the movie. Unfortunately it offered nothing that the movie did not. I.E. Gaston a war hero, Belle the inventor, etc. It did, however, flesh out the characters a bit more and offered a bit more of an insight to Beast's relationship with his servants. I think that was the only bit of redemption this book gave to the movie. If you liked the movie, then this is definitely for you.